Dare I say it? 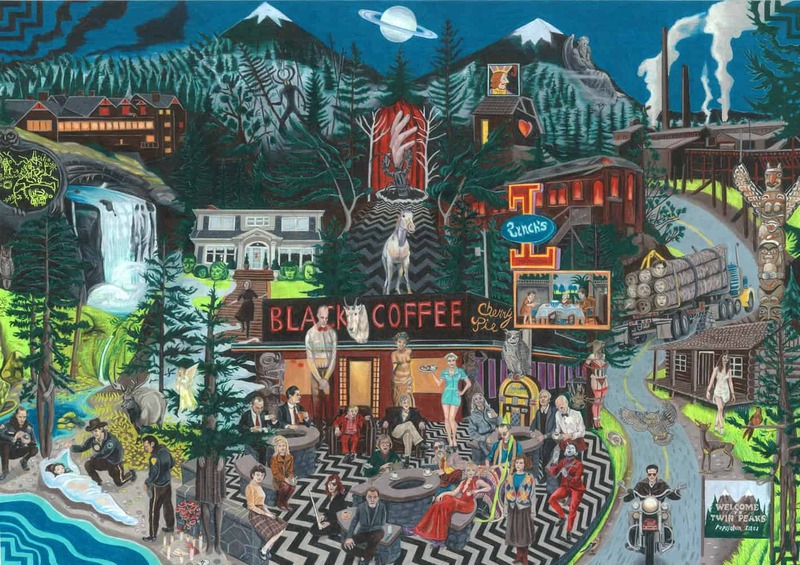 Yes, the work of Flemish Renaissance painter Pieter Bruegel the Elder came to mind when Marco Sparta showed me his epic Twin Peaks illustration titled Into The Night. Bruegel, and perhaps a bit of Where’s Waldo? The piece took me a month to finish, fueled with Julee Cruise and Angelo Badalamenti‘s music, coffee, and anxiety. Using colored pencils on a 300 gr paper canvas of 100 x 70 cm (40″ x 27.5″), the Italian illustrator was able to unite dozens of characters plus most of the show’s symbolism in a way quite similar to Bruegel’s 16th century masterpieces Netherlandish Proverbs and Children’s Games. Use the magnifying glass to explore the illustration in detail. Seriously, there’s a lot going on in this illustration and some references are more obvious and literal than others. It’s not just Twin Peaks either. Let’s see if you can spot Angelo Badalamenti as his Luigi Castigliani character from Mulholland Drive? And the severed ear from Blue Velvet? One of the least obvious references I think, is the Roman god Saturn who had his own festival [Saturnalia] which was about feasting, role reversals, free speech, gift-giving and revelry. And if you’re wondering why the coffee tables are pits, they’re just something the artist always regarded as “a great source of mystery.” I had to ask Marco though: where’s Waldo… the bird? You are the second to ask me where Waldo is in the piece… so now I regret not including him. Nah, don’t worry. It’s an epic piece of work! Prints of Into The Night are available here (10×8″ up to 38×28″) or directly via Marco Sparta. The artist is also selling the original artwork.